On January 5, Secretary of State John Kerry released an exit memo with an overview of the Obama Administration’s foreign policy over the last eight years. The following is an excerpt on Iran from the memo with other remarks from January 2017. Pursuant to the JCPOA, the United States and our partners have, in turn, lifted nuclear-related sanctions on Iran – the sanctions we put in place precisely to reach this kind of diplomatic solution. This has created opportunities and the prospect of a better future for the Iranian people. As for the Iranian government, while we have made clear we are open to a different future should its many objectionable policies change, it has yet to demonstrate a willingness to do so. Our relationship remains highly contentious – and we must maintain our pressure and continue to push back on Iran’s missile program, its support for U.S. Department of State 6 terrorism, its disregard for human rights, and its destabilizing interference in the affairs of its neighbors as long as these threats persist. The second area that I want to highlight is the Iran nuclear agreement, which is a demonstration, quite simply, of the power of diplomacy to be able to address major international problems short of war. The Joint Comprehensive Plan of Action has made the world and our allies safer, including Israel and the Gulf states. Let me be very explicit about that. When we sat down to begin that negotiation, there were more than 19,000 centrifuges spinning and enriching fuel. There were 12,000 kilograms of enriched radioactive fuel material, which with one more enrichment could move to bomb-level development capacity. There was enough nuclear material to be able to produce somewhere between 10 to 12 bombs, if that were the direction that Iran decided to continue to move. And a unilateral approach or refusing to negotiate at all, which some advocated, would have left us with two very bad choices: the short-term risk of a nuclear-armed Iran, and yet another conflict in the Middle East. And to be clear – to be crystal clear – terminating that agreement now would leave us with those same bad choices. You cannot make a bomb with 300 kilograms of enriched material – that’s all they have today – from 12,000. You cannot make a bomb when you are limited to 3.67 percent of enrichment, and that is being tracked on a daily basis. The number of centrifuges today is down to about 5,000, which is permitted under the agreement. So what we’ve seen is the joint plan has in fact blocked each of Iran’s pathways to a nuclear weapon, and I might add, by the choice of Iran to submit to this – not because it does it in and of itself, but because this is an agreement and Iran agreed to these terms of the agreement. We have eliminated 98 percent of the stockpile that existed of enriched uranium, and we’ve shut down two-thirds of the centrifuges, and we have made the overall – I think a better way to phrase that is that the agreement, because it takes two to create an agreement, or more – in this case the P5+1 – the agreement itself creates the most rigorous inspection regime that has ever been negotiated. We simply could not have accomplished any of that by going it alone, which is why we engaged in a joint diplomatic effort, and the result is that we now have the world on our side. The world is supporting this agreement and supporting the fact that a potential nuclear weapon has been eliminated in a particularly volatile region of the world. The result is that if we maintain our leverage and meet our obligations, then we will be able to ensure that Iran has a reason to and a requirement to do the same. MS WOODRUFF: What are you absolutely confident most endures that this Administration has done globally on the world stage? And what are you most worried about? 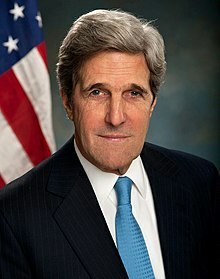 SECRETARY KERRY: Well, I’m – I really believe common sense is going to win out. I mean, it doesn’t make sense to – let me give you an example: the Iran nuclear agreement. There were in 19,000 centrifuges spinning, producing enriched material. Now there are 5,000, which is what is allowed. There was a 12,000 kilogram stockpile from which you could have made 10 to 12 bombs if you enriched it. Now there is a 300 kilogram stockpile, limited to 300 for the next 15 years, and it is physically impossible to build a bomb with 300 kilograms of material. Iran is limited to 3.67 percent enrichment. You cannot build a bomb at 3.67 percent enrichment. So with the 130 additional inspectors who are in Iran, watching what’s happening, I’m absolutely confident about the route to a weapon being blocked. Now, if that were just arbitrarily undone, we’re going back to a place of conflict almost immediately. We’ll also reduce our credibility in the world, because I suspect the Russians and the Chinese and the French and the Germans and the British will just continue the deal. And we’ll be sitting there outside with our credibility grossly damaged, and with Iran saying, “Well, we lived by the agreement, but now the United States isn’t willing to, so we’re going to do what we’re permitted to do.” And then you’re right back where you were, where we had pressures on us to go bomb Iran. Believe me, there were pressures.